PA State Rep. Fred Keller - Celebrating Our Country! 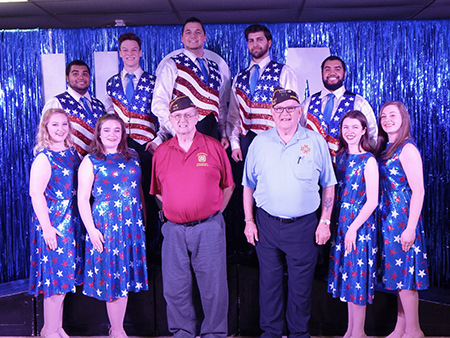 Re-Creation USA performed “Patriotic Review” at Selinsgrove VFW Post 6631 over the Memorial Day weekend. Pictured with Selinsgrove VFW Post 6631 officers Harold Aucker, Post Quartermaster, and Douglas Hammett, Post Commander, are Re-Creation cast members (front row, from left) Devon Donahue, Julie Horan, Alexis Long and Gabby Darrin, and (back row, from left) Jordan Marolf, Tyler West, Jonathan Hepler, Austin Eisner and Nick Marolf. Learn more about Re-Creation USA here. To help ensure public assistance benefits are dedicated to those truly in need, the House endorsed legislation this week to prevent convicted drug dealers from receiving welfare. House Bill 129 would prohibit individuals convicted of violating the Controlled Substance Act from eligibility for public assistance. The applicable sections of the Controlled Substance Act are the so-called “kingpin” provisions which relate to a specific set of offenders who sell and deliver large quantities of illegal drugs. When individuals are arrested for drug trafficking crimes, a subsequent search by law enforcement often reveals large sums of money and information indicating that the individual was receiving welfare benefits. In an effort to help ensure justice and safety for crime victims, the House Judiciary Committee this week reported out several bills to empower victims and safeguard them from being penalized or ignored by the justice system. Among the bills in the package are those designed to give child victims safe harbor protections, particularly so they can get the crucial help and services they need; prevent young children and those with intellectual disabilities and autism from feeling victimized all over again by testifying against their abuser; exclude evidence of past sexual victimization from trials; and amend the state Constitution to include a Victim’s Bill of Rights (Marsy’s Law). Additionally, the package includes a comprehensive rewrite of the state’s anti-hazing laws. Of note, the bill would encourage students to seek emergency assistance for those who have been hazed, and individuals would be immune from prosecution for hazing and underage drinking if they call 911 or law enforcement, believe they’re the first to call for help, and remain with the victim until emergency personnel arrive. Keeping students safe was the goal of bipartisan legislation endorsed by the House Education Committee this week. The first measure, House Bill 2327, would allow public school entities, such as school boards, to go into private, executive session for school safety discussions. This would prevent information about a school’s security measures from falling into the wrong hands and compromising student safety. The second, House Bill 2215, would require school entities to conduct one school security drill per school year in each school building in place of a monthly fire drill. This would take Act 55 of 2017, which was passed last year to encourage schools to conduct the safety drill yearly, one step further to enhance school safety. With warm weather finally here, many people enjoy going outside for some fresh air and exercise. Whether you are just taking a stroll around the block or training for an upcoming 5k, it is important to keep pedestrian safety in mind. In Pennsylvania during 2017, there were 4,086 reportable pedestrian crashes resulting in 150 fatalities and 455 suspected serious injuries. Unplug – don’t be a distracted walker. Make eye contact – don’t walk until traffic stops. Be bright – wear reflective clothing at night. Never jaywalk – use crosswalks and intersections. Stay alert all the way across the intersection. Watch for turning vehicles of all kinds.